I did this physical examination almost every day to my patients. Sharing is caring. Check this out! It's a crescent-shaped space overlying the stomach. Percussion should be carried out at one or more levels of Traube’s space from medial to lateral. 1. Right : the inferior margin of the left lobe of liver. 2. Left : the anterior border of the Spleen. 3. 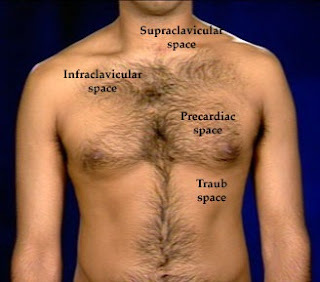 Superior : lower edge of the left lung (Resonance of lung). 4. Inferior : Costal margin. 1. Fundus of stomach (Hence percussion of Traubes area normally gives Tympanic note). 2. Costo-phrenic recess of left pleura devoid of lungs. This maneuver has a sensitivity and specificity between 60 and 70% for splenetic enlargement; however, the sensitivity and specificity increases to approximately 80% in non-obese patients who are fasting. 2. Left sided Pleural effusion. 3. Enlargement of left lobe of liver due to any etiology. 5. Proliferative growth in fundus of stomach. 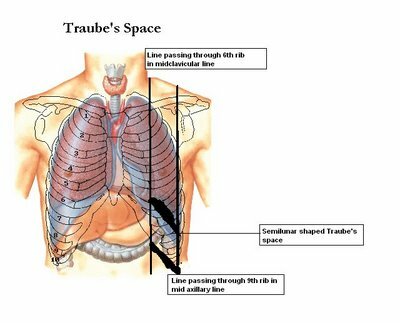 Note: A left lung mass lesion/consolidation alone never produces impairment as lung is not extending to traube's space. Thnks a lot for sharing..
Have a happy married life ahead..
i think it's left anterior axillary line.not mid. May Allah(SWT) bless you abundantly. which is cheaper in B&W however what about general usage. Is 300 dpi the minimum requirement for all prints? printer on Mac exactly how can I take prints of a number of web pages in Mac. Hp 1500 printer software application, all are working fine. you may be a great author.I will be suге to bookmark youг blog аnd will cοme baсk dοwn the road. I want tο encourage yourself to continue уour great јob, have a nice morning! great explanation; very helpful and precise content. masha allah!!!!!!! !